âœ… Come and learn about the secrets of the now famous Ayurvedic meals offered at VRMA, and get the Vedic Advantage for your family! 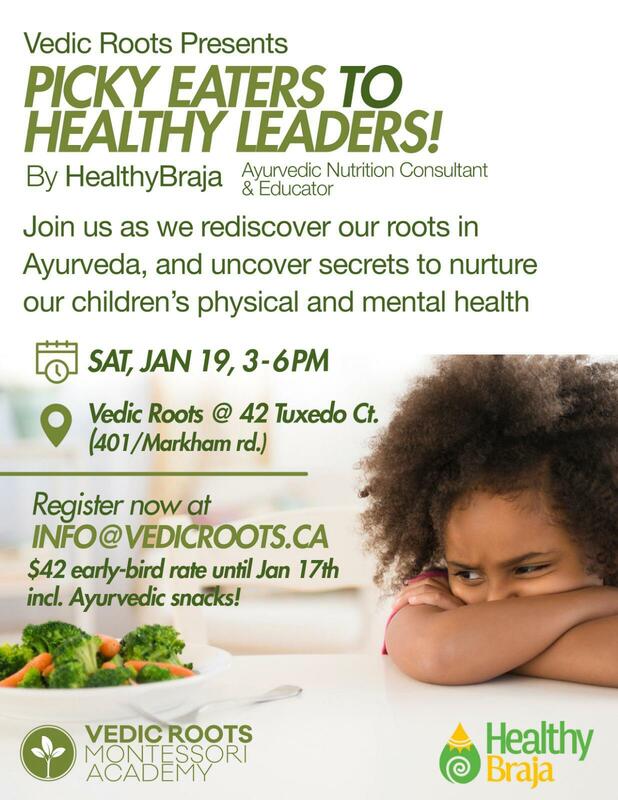 âœ… This interactive seminar will be facilitated by HealthyBraja, VRMAâ€™s Ayurvedic Nutritionist and Consultant, who expertly designs our menus and guides our cooks and teachers to bring holistic nutrition to our children.ðŸ‘‰ Please take advantage of this wonderful opportunity, as well as kindly help spread the word so that more families can benefit from this knowledge of Ayurvedic diet and nutrition. ðŸ‘‰ Did you know that nearly 40% of calories consumed by children ages two to 18 are empty calories, the unhealthiest kinds of calories? Half of these calories come from sugary fruit drinks, cake, cookies, donuts, ice cream, pizza and more. These foods can create problems with digestion, congestion and allergies! And the immunity depends on healthy and vibrant digestion during childhood and beyond. ðŸ‘‰ With just few simple dietary tips, you can make a huge difference to your childâ€™s development: physically, mentally, emotionally and spiritually!